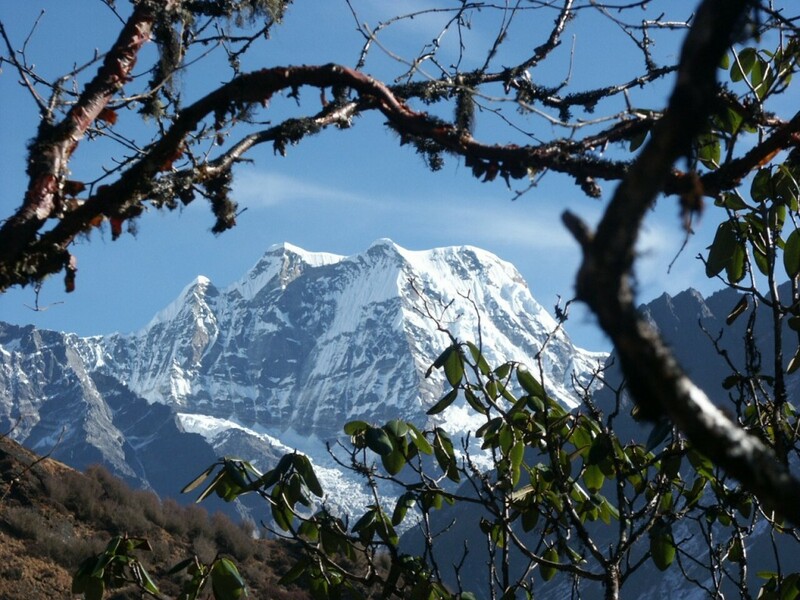 There are some facts about Mera Peak, one of Nepal’s most popular trekking peaks, that not many people know. This is partly the fault of adventure travel companies offering it as a trip, whose literature can range from vague to deliberately misleading. In this post I’d like to straighten some of these questions out. 1. Is it a trek or a climb? In fact it’s a climb, but if you don’t consider yourself to be a climber then don’t let this put you off. It’s a good mountain for trekkers who would like a straightforward introduction to mountaineering (see my related post When does trekking become mountaineering?). The majority of the ascent involves a walk up a glacier requiring basic ice axe and crampon skills. There is plenty of opportunity to gain proficiency in these at the bottom of the Mera Glacier. 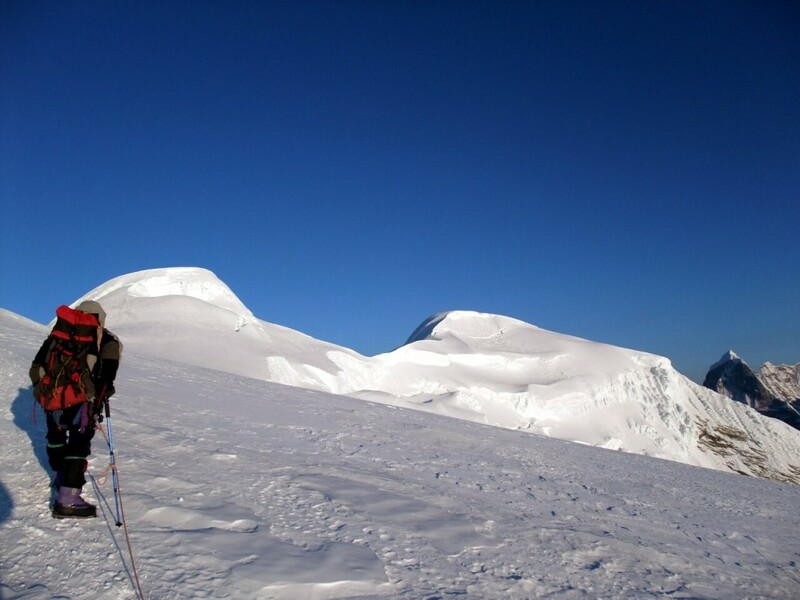 Although the mountain has a trekking summit of 6431m which needs nothing more than this, Mera Central, the summit most people climb, usually involves a 30 metre ascent of a 60° snow dome using fixed rope and jumar, depending on snow conditions. 2. What’s a good mountain to try before attempting Mera Peak? Anyone who has climbed Kilimanjaro, Africa’s highest peak at 5895m, can consider themselves in a good position to have a go at Mera Peak. They will have experience at high altitude and camping conditions on trek. A one week course involving an introduction to alpine mountaineering skills would also be excellent preparation, but as I’ve mentioned above the necessary technical skills can easily be acquired on Mera itself. 3. What’s the best way to trek in to Mera Peak? Many tour operators fly into Lukla and take their clients straight over the 4610m Zatr La pass to Tangnag at the foot of Mera Peak. This is a tough tough way to start the trek, however. Lukla is at only 2800m altitude, and to go straight over the pass from there is a dangerously quick altitude gain for trekkers who may never have been to high altitude before. To compensate for this and give them opportunity to acclimatise, many of these operators take their clients up the busy Everest trail to Namche Bazaar instead. This is a missed opportunity. South of Lukla there is another route to Tangnag which involves trekking up the remote and beautiful Hinku valley, passing through rhododendron and bamboo forest, up to grassy moorland and along high mountain trails. This provides a fantastic trek which for many will be as memorable as the climb itself. You can always come back over the Zatr La after you’ve climbed Mera. 4. Which is the true summit, Mera North or Mera Central? This is perhaps the fact which will surprise you the most: nearly all tour operators don’t actually take their clients to the true summit of Mera Peak. Almost to a man they will climb 6461m Mera Central, but just a stone’s throw away the true summit, 6476m Mera North, is hardly ever climbed. Why they do this is unclear. I climbed both summits in 2009 and confirmed their respective heights using my GPS. Mera North is actually less steep than Mera Central and easier to climb, and herein may lie the reason: it means the slopes look more likely to avalanche and therefore a better bet for more experienced climbers who move more quickly and are familiar with skills such as ice axe arrest. Do not expect to find any big commercial operators offering climbs of Mera North. To do this you will need to find yourself a reliable trekking agency to provide you with the logistics and go independently. 5. Can I see Everest from the summit? Yes, in fact on a clear day you will see five of the six highest mountains on Earth. Cho Oyu (8201m), Lhotse (8516m), Everest (8848m) and Makalu (8463m) are all very close by, and when it’s clear you may just be able to see Kangchenjunga (8586m) on the Indian border far away to the east. Only K2 (8611m) in distant Pakistan is beyond your vision. It’s a truly memorable view that you will never forget. 6. Who climbed it first? The British Army officer Jim Roberts, the grandfather of trekking in Nepal, and his Sherpa Sen Tenzing were the first people to climb Mera Central during a reconnaissance of the Hinku and Hongu valleys in 1953. The honour of being the first to reach the true summit goes to the Frenchmen Marcel Jolly, G Baus and L Honills, who climbed Mera North in 1975. 7. Where can I get a flavour for what climbing Mera Peak might be like? 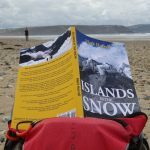 You can read my travel diary Islands in the Snow, of an expedition to the region in 2009. We trekked in up the Hinku valley and climbed Mera’s three main summits, before descending into the beautiful Hongu valley, trekking up and over the difficult Amphu Labtse pass and climbing nearby Island Peak. After the climbs I spent some time tea house trekking in the Gokyo valley beneath Cho Oyu. And if you have a Kindle, I have recently made the diary available as an e-book. 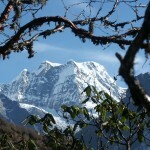 ← Is the Manaslu Circuit the new Annapurna Circuit? Lots of you have emailed me asking for recommendations for trekking agencies and guides to climb Mera Peak. There are literally hundreds and to single any one out would be unfair on many of the others. It’s not what this post is about, and I don’t want the comments to be spammed with people recommending their own services. 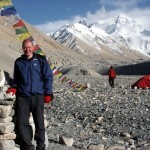 HI Mark thanks for the tips – ive been wanting to climb Mera since doing the Everest BC trek in 2009. Ive found a treking company that do the trek – but there English isn’t great. If its not too much trouble can you take a look at their itinerary and see if their route is what you suggest in point 3 above? I think it is, but thought you might have more knowledge! Also its a 16 day trek. Is this the average time it takes? Thought it took longer. I’ve not been able to find any of the places mentioned between Lukla and Tangnag (Thukdingma, Chhatrwa or Thaksingdingma) on any of my maps of the region. Spellings often vary (Thagnak is clearly the village more commonly spelt as Tangnag). If Thaksingdingma is the village labelled as Tashing Dingma on one of my maps then it looks like they go straight over the Zatr La from Lukla, which is a route I wouldn’t recommend. Thanks Mark – appreciate your knowledge on this. Hi Greg, I would get some big expedition experience on 6959m Aconcagua. If reaching 7000m is more important then Lhakpa Ri in Tibet is more straightforward. I climbed Mera in April 2003 and this is an excellent summary of the climb. Was lucky enough to see 5 out of 6 of the tallest on summit day. Everest is scary even from afar.. Completely agree about the trek out of Lukla through the rhododendron. What an amazing 3 weeks all round. Sad to hear about the recent impact of the earthquake. pls let me know the difficulty level of mera peak. 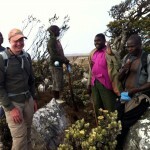 i just finished kilimanjaro, but only trekking was involved and not mountaineering. pls guide for the training. Thankyou. 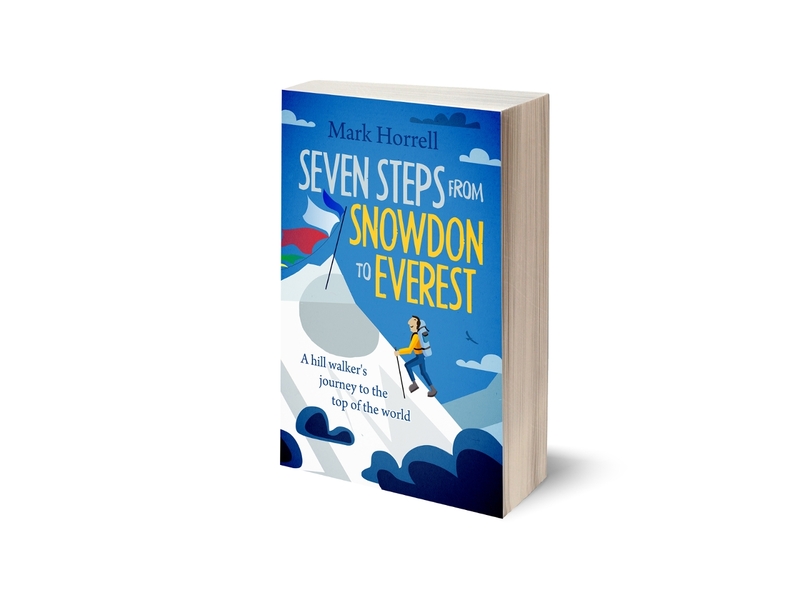 Hi Mark, I am looking forward to trekking Mera and island in Oct – wanted to purchase a hard copy of your Islands in the snow diary to take with me but I’m in Australia and can not seem to find anywhere to purchase it. Seems only soft copies available? Can you help? Thanks. I have only done trekking and not mountaineering. Last did Stok Kangri 6121m; it required glacier crossing and crampons but no real mountaineering technical skills. Never used ice axe. Please advice if Mera is doable and what technical training I should seek prior? Yes, if you’ve climbed Stok Kangri you should be fine. There’s a bit more glacier on Mera Peak, and a short ice climb onto the summit dome. Most operators and guides are able to get their clients up this section without prior experience, so your crampon experience on Stok should serve you well. Mera is also more physically challenging. I own G10 walking crampons and womens La Sportiva Trango’s – would these be suitable for Mera? I can’t seem to find information on whether climbing crampons are necessary. I’ve not worn Trangos. I did a quick Google search and they look a bit light for Mera Peak. Expect temperatures of -30C if going in the autumn season. Double mountaineering boots are essential if you don’t want to risk frostbite. This means climbing crampons too.